Be the first to share your favorite memory, photo or story of MARY FRANCIS. This memorial page is dedicated for family, friends and future generations to celebrate the life of their loved one. 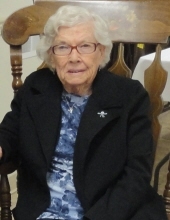 Mary Francis Ivers Broughton, age 92, of Pleasureville, died Wednesday, March 27, 2019 at the Baptist Health in La Grange. She was born March 20, 1927 and was the daughter of the late Clifford Ivers and Sybil Sewell Ivers. She was a member of Point Pleasant Christian Church. She is survived by her grandchildren: Elizabeth Broughton, Gracie Broughton, Zachary Stalker, Ralph Stivers, and Hope Stivers Lavertu; several great-grandchildren,and several nieces and nephews. She was preceded in death by her husband: J.T. Broughton; a son: Terry Broughton; one grandchild: Hannah Broughton; two sisters: Nancy Ivers Wallace and Claudia Ann Bailey; and three brothers: Jay Ivers, William Ivers, Sr., and Roy Thomas Ivers. Services will be held 4 p.m. Sunday, March 31, 2019 at Sholar Funeral Home of Pleasureville. Pastor Carla D’alessio will officiate. Burial will be at Pleasureville Cemetery. Visitation will be from 1 p.m. until 4 p.m. the day of the services. Pallbearers will be Jim Wallace, Ralph Stivers, Zachary Stalker, Andy Ivers, Matthew Brent, and Larry Wallace. To send flowers or a remembrance gift to the family of MARY FRANCIS IVERS BROUGHTON, please visit our Tribute Store. "Email Address" would like to share the life celebration of MARY FRANCIS IVERS BROUGHTON. Click on the "link" to go to share a favorite memory or leave a condolence message for the family.